Over the last month or so I have been competing in several Xterra trail runs with local orienteer’s Piret Klade, Tim Robertson, and Jamie Stewart. Xterra is a series of trail runs with breathtaking views, jagged coastlines and lush native bush. There are four races the series this year each consisting of a short, middle, and long courses. I have been running the long courses, with three down and one to go. The first race took place at Red Rocks and began with a taxing climb up the Tip track which quickly separated the pack with a small handful of runners, including The Moose and fellow orienteer Jamie Stewart, forming a group at the beginning of the first decent. NZ mountain runner Julian Davidson quickly established a lead of roughly one minute. The second 400m climb approached faster than I would have liked, and I was already feeling some fatigue in my legs due to a lack of a proper warm up! Motivated to get a lead on Jamie as we began up the Radome track together I settled into a rhythm and jogged up the slope. I was determined not to do any walking during this race, and doing so caught and passed the person in second, and even managed to get a 30sec lead on Jamie. However Davidson was still a speck in the distance. The top of the hill couldn’t have come quick enough, but when it did I was ready and started going at a 5km pace doing just over 3min/km for the short stretch of tar seal road where I closed the gap between me and Davidson and extended my lead on Jamie thanks to an energy gel! A hard technical decent on loose gravel gained me the lead and put me in front at the start of another steep, but this time short climb, before joining the other courses and beginning the final leg of the race along the coast. In the last section I managed to get a solid lead on Davidson and take out the win for the first race of the series. 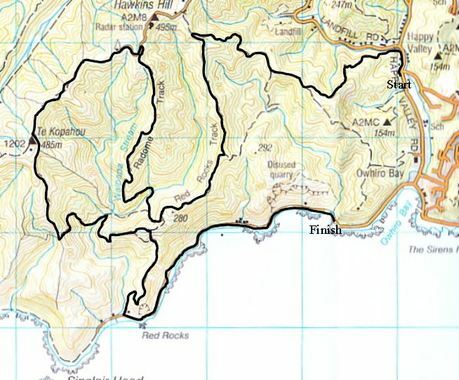 The second race was a scenic run of about 16km and 800m climb through the beautiful Orongorongo’s. A long climb of 700m separated the runners quickly with me and Tim gaining a substantial lead on the main pack; however attempting to keep up with Tim up the hill was a bad idea as my legs hadn’t been feeling good that morning, again thinking it was because of a poor warm up, and so I was reduced to a walk while Tim raced off with ease. Little did I know that the pain in my legs was the first signs of something more sinister than mere fatigue. I was feeling quite bad about having to walk and even got passed on the way to the summit but when I hit the flat I was starting to feel better and picked up the pace and rapidly caught the person in second and established a good gap between me and him. When I reached the downhill already some 3mins behind Timmy it became difficult to run at pace as the slower runners from the middle course were running/walking up the track we were supposed to be running down! I ended up falling over twice trying to avoid smashing into people and cut open my knee quite badly, I can only imagine it would have been worse for Tim passing through them 3 minutes earlier than me. The rest of the race was rather uneventful with a flat run along a gravel track up a short climb and then back along a road to the finish. Tim established and held a very impressive lead throughout the race to win by 5mins, 2nd place went to The Moose with 3rd place 8mins behind him. Orienteers were out in force with Piret Klade winning the Womens long course by just over 7mins! 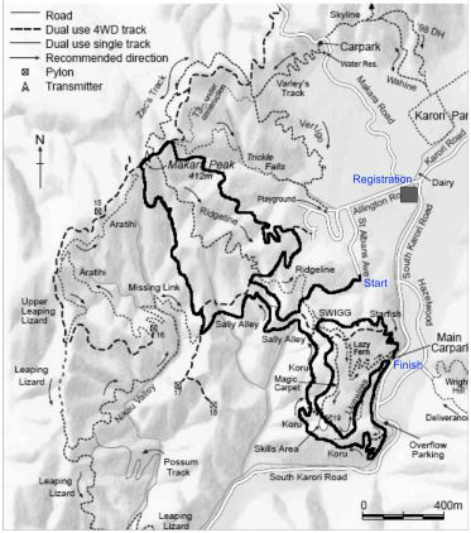 The third race was a chilly night race through the Makara Peak mountain bike park in Karori. The race of around 10km began with a relatively easy climb up the new track, North Face; I was in the front bunch of runners, it was quite a large group as they had combined the middle and long courses for the night event. Again I wasn’t feeling so good up the hill and put it down to cold air aggravating my asthma and another poor/lack of a warm up. I was in the front of the group for the first half of the climb until NZ triathlete and training buddy Lachlan Davey decided to make a move as we were running too slowly for him! By the time we reached the top of the hill he already had a minute lead on us, but I was determined to catch him on the downhill so I started running hard down the four wheel drive track at a 2:50min/km pace. I had gained 30secs on him down the first 2km of the decent and was settling into the single track of Sally Alley when my rhythm was abruptly broken when the long course met up with the short course and it was difficult to pass the slower runners on the thin track! I was thoroughly miffed at the poor organisation of where the courses meet up as it disrupted the runs of me and many other long course competitors. By the time I had managed to pass the short course runners Lachlan had regained some time on, but I had a really good motivation to catch up as I could see his light coming from the other direction as we raced around the switchbacks near the end of the decent.There was still time to catch up as there was one last climb to go before the finish line. I wasn’t feeling good going up the hill, but pushed as hard as I could down the final decent for the sheer fun, as I thought that Lachlan had furthered his lead when running up the hill and had already finished. In the end I ended up only 18secs behind him claiming another second place in the series. The fourth race is around Belmont on the 15th of June, however I am unsure as to whether or not I will be doing this race or not as it is nearing when I depart for Europe. I should have been listening to my body and easing up when I was feeling really fatigued during the runs, over the last week I have been having quite a lot of pain through my calves while doing running and I have researched what the problem might be. I have determined that I have shin splints caused from running on hard surfaces too often, so I’m going to be icing my legs a lot and doing swimming and biking for the next two weeks so that I have a chance to recover. 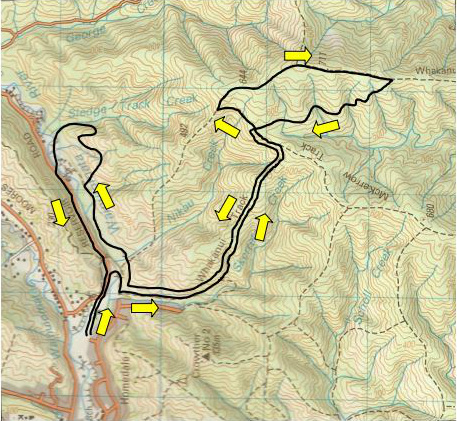 I will be playing even more catching features to make up for missing out on orienteering trainings! If all goes well I should be up to a moose-like pace by the time I leave for Europe.